Hey girls! Sorry I haven't posted in a while, I'm back up at uni now and have no Internet..unless you count my blackberry. I'm hopefully getting it sorted out by the end of this week so I can be back to posting like normal! 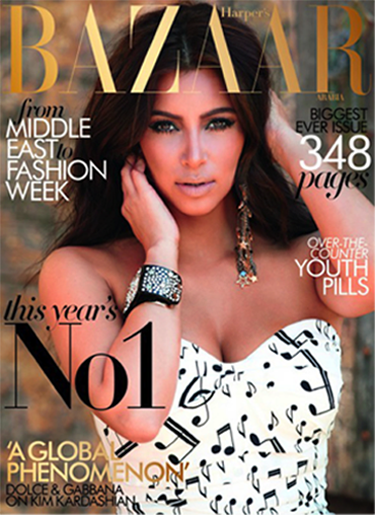 Anyway, I saw this picture of Kim on the latest cover of Harper's and WOW. How amazing does she look?! The dress is quite unusual but it looks stunning on her as per normal. I'm currently ill so I've been living of Lemsips for the past few days. It's no fun! I need to take pictures of my room to show you how I've decorated it. It's very umm...Disney Princess inspired. I hope you like this outfit I put together, it's perfect if you have a tan..or for the general public in England, once you fake tan it will look nice haha. Although, the sun this week has been pretty nice right?! Hope your having a good week so far! ahh that dress is gorgeous, I have one similar without the straps and this one looks so much nicer. awesome blog!!! I love it! !